KUALA LUMPUR : There will only be an increase in the retail price of RON 97 petrol for the price week March 23- 29. 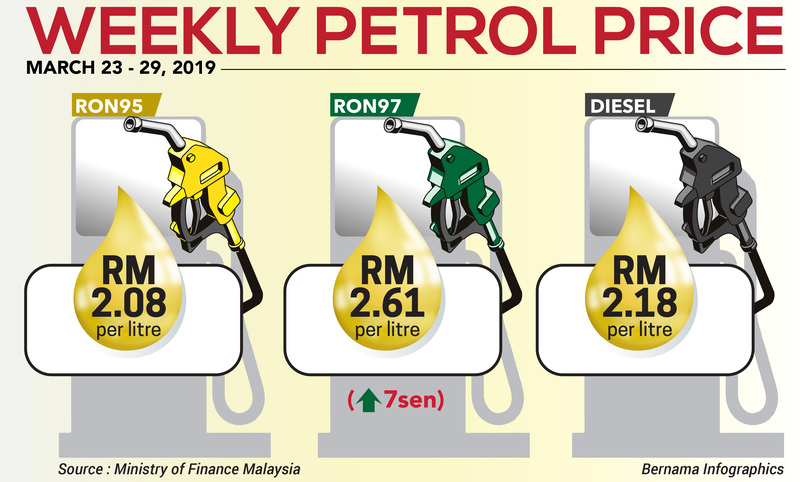 The Finance Ministry in a statement here today said the premium petrol will cost seven sen more, at RM2.61/litre, as compared to RM2.54/litre the previous price week. The retail prices of RON 97 and diesel remain unchanged, at RM2.08/litre and RM2.18/litre respectively. The ministry said maintaining the retail prices of RON 97 and diesel was in line with the government’s decision to stabilise fuel prices so as to alleviate the cost of living. The prices of these two fuels is determined through the managed float system whereas pricing for RON97 is dictated by market forces. RON 97 up seven sen 0 out of 5 based on 0 ratings. 0 user reviews.